My blog posts often deal with blood and thunder, conflict and battle, but this present item deals with a middle-aged lady of poor background, a Miss Betty Mouat, who demonstrated great heroism in peacetime without having any prior warning that her courage and endurance would be called upon. 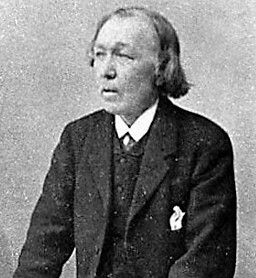 I have been an admirer for many years of the Scots poet William McGonnagal (1825-1902) whose style was truly unique and whose command of verse can only be described as unmatched. He produced an enormous canon of work and there was hardly a natural disaster, national tragedy, military victory or notable contemporary event in the late nineteenth century about which the poetic muse did not inspire him to write. Many of these happenings would probably be forgotten today were they not recorded in McGonnagal’s collected work. I was drawn to the subject of this present blog by a poem he wrote about it. The event in question was not of massive national significance but it was the unexpected adventure of Betty Mouat, a quiet, middle-aged Scottish lady who came through a ghastly ordeal with courage and spirit undimmed. In 1886 the unmarried Betty Mouat was 59 years old. 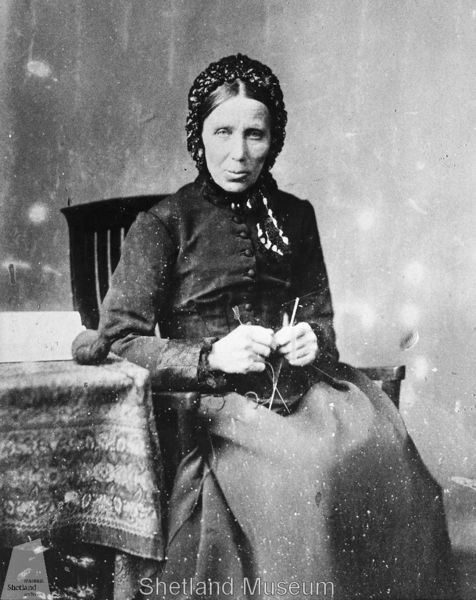 She supported herself by knitting and she lived with her half-brother’s family in the tiny hamlet of Scatness near the southern tip of the main island of the Shetlands group. As will be seen from the map below it is one of the most remote inhabited locations in the British Isles and in the 1880s life would have been hard and primitive in the extreme. Her background was a tragic one – her father had died six months before her birth when the whaler he was serving on disappeared in the Arctic. Betty Mouat’s poor luck continued – a cartwheel broke her leg, and she was once shot in the head by a man hunting rabbits. She herself had suffered a stroke shortly before the events recounted below but in view of what transpired one can only assume that it was not a seriously debilitating one. In January 1886 however Betty Mouat had occasion to see a doctor in Lerwick, the island’s main town and about 25 miles to the north. Given the poor state of the roads, she elected to travel there in the Columbine, a small cutter-rigged sailing craft that carried mail and passengers. A short sea-passage was also preferable since she was bringing some forty hand-crafted shawls with her for sale on behalf of herself and neighbours. 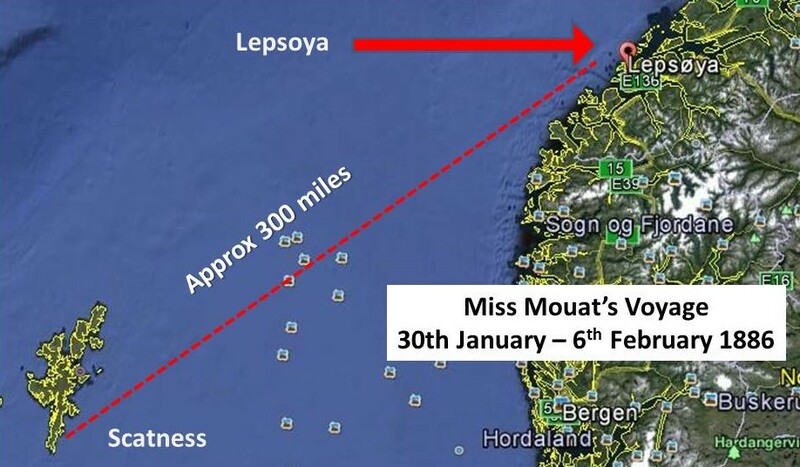 On 30th January the weather was deteriorating and the Columbine’s captain warned Miss Betty Mouat that a rough passage could be expected. He advised that she might better wait. She was quite adamant however – sail in the Columbine she would. She came on board with her merchandise and with two pints of milk and two biscuits for refreshment during the expected three or four- hour passage. She went down into the small cabin and settled herself. Disaster struck within half an hour of departure. The main sheet broke, allowing the boom to swing free and in the process of securing it the captain was thrown overboard. 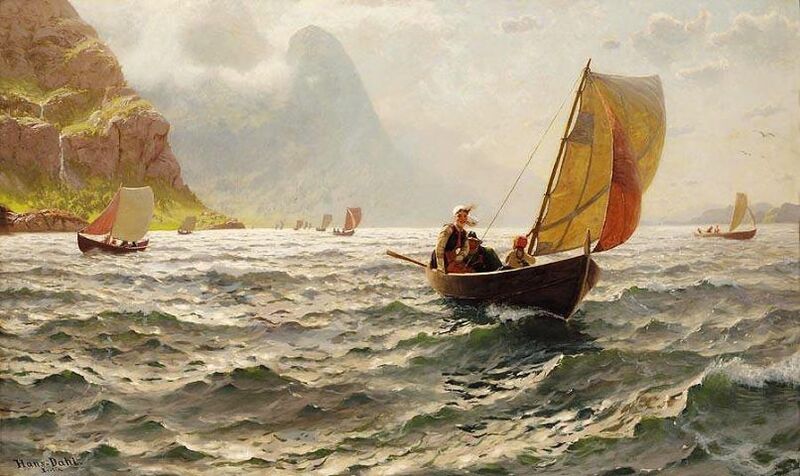 The craft carried two deckhands and now – with the Columbine unable to manoeuvre due to the unavailability of the mainsail – they took the decision to launch the vessel’s single row-boat and go to the captain’s rescue. Given the weather conditions it seems remarkable that they expected to get back to the Columbine. The captain could not be found but by the time they realised that their search was futile the Columbine had been driven too far off to reach. She was carrying Betty Mouat, the only passenger, with her. The two deckhands were successful in reaching shore and raising the alarm but given the communications of the time the response could not be immediate. 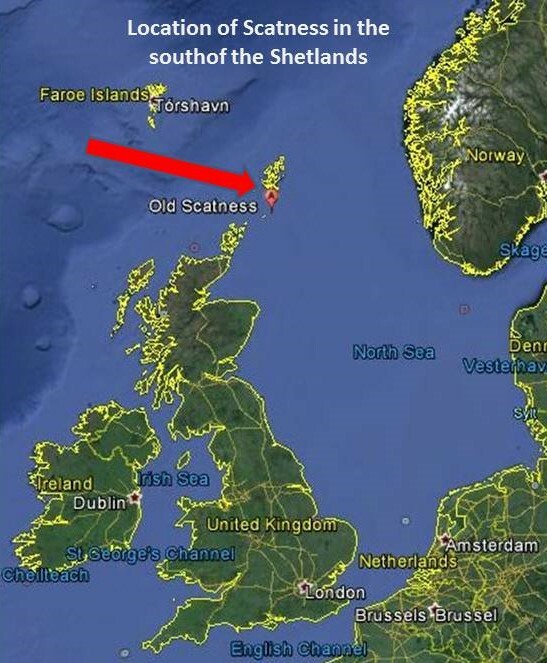 While the Columbine was being driven roughly north eastwards by the storm, across an area of sea now studded with huge oil and gas production platforms , attempts were being made in Shetland to get a search underway. The result was that two steamers owned by local shipping companies searched over a wide area, but without success. The ordeal that continued over the coming days might have driven a lesser woman insane. Betty Mouat kept her nerve however, despite all that nature threw at the Columbine. Confined to her small prison, unaware of where she was, she continued to pray, to keep herself supported to avoid injury, to wind the watch, to sleep somehow and to eke out her milk and two biscuits with iron self-discipline. As the weather eased somewhat she managed to wedge a box beneath the hatchway. By standing on it she could keep a lookout. Miss Mouat’s linguistic isolation ended when a message was got to an Englishman living relatively close by, a manufacturer of cod-liver oil. He helped arrange a passage on a Norwegian vessel from nearby from Aalesund to Hull, and transport onwards by train to Edinburgh – the first time she had been on a train. Her story had already been receiving sensational treatment in the press and when she arrived in Edinburgh she found hundreds of well-wishers waiting at the station. A Shetland family living there had offered to give her accommodation and she was driven the house in a carriage to the cheers of the crowd. Betty Mouat was to remain there for three weeks, visited by the rich and curious – some of whom asked for locks of her hair. She turned down offers to recount her story on the stage, including in London, and was happy to return to her home in Scatness. A fund was set up on her behalf, one of the contributors being Queen Victoria, who donated £20. Betty Mouat never left Shetland again, though on occasions tourists came to ask about her experience. She appears to have been invariable patient and courteous, as admirable on home ground as she had been at sea. It is pleasing to record that Betty Mouat lived on to the age of 93, dying in 1918, an example not only of courage and indomitability, but of how an apparently unexceptional person can rise to the greatest heights of heroism when confronted with unexpected challenge. A splendid woman – and worth remembering.